Shah Alam – Acknowledging how essential computer skills can translate into high-demand jobs in today’s digital world, Fraser & Neave Holdings (F&NHB) continues to provide youth from underprivileged backgrounds at Montfort Boys Town with opportunities to explore their capabilities and reach their full potential, through the International Computer Driving License (ICDL) certification course. This is especially so when the world is moving rapidly and emerging technologies are evolving at an increasingly fast pace in the age of the Fourth Industrial Revolution. Society especially the youth have to become agile and adaptable with the willingness to learn new skills and embrace change in order to achieve greater career success. The ICDL course, held since 2011, is part of the F&N IT Corner programme which was established in 2010 to help the youth of Montfort Boys Town acquire the necessary computer skills to gain advantage when they enter the competitive working world upon graduation. Designed for youth from different levels of digital literacy, the ICDL course helps beginners improve and fully grasp basic computer skills for common real-world application. Speaking at the graduation ceremony for the latest batch of 44 students who successfully completed the ICDL course, Cariessa Goh, F&NHB Corporate Affairs Manager commended the youth for their hard work and commitment to accomplishing their goals. “The ICDL course offers an avenue for the students to attain fundamental knowledge and skills in basic computer applications including managing files, word processing, developing spreadsheets, database and presentations, image editing as well as information and communication functions. “The students have proven their drive, passion and persistence to succeed throughout the ICDL course. Today’s graduation ceremony shows that they are determined and full of boundless tenacity to overcome any challenges in life and develop crucial skills such as problem-solving and critical thinking to prepare themselves for their future careers. “We feel humbled and pleased for being able to contribute to the ICDL course for the ninth time this year. We are honoured to be given the trust to empower the students of Montfort Boys Town to take ownership of their learning journey and responsibility for their future. We are confident that the course has equipped the students with the right tools to increase their employability and competencies in the workforce,” she added. Twenty-year-old Bryan Lit Zhen Cong graduated with flying colours with a certification in Computer Maintenance, scoring full marks each in Presentation and Spreadsheet while getting above 90 per cent marks in Word Processing and Computer Essential respectively. “The ICDL course has truly benefitted me as I am now able to use Microsoft programmes efficiently and effectively. I could not believe that I achieved the highest score for Presentation as it was quite a challenging subject for me to learn during the course. I am really happy with the results and the certification gives me more confidence to strive for greater success and explore various career opportunities in the near future,” he said. Another graduate, Elizabeth Abon decided to pursue the certification in Graphic Design and Multimedia as she is passionate about drawing and wanted to unleash her creativity and unearth her talent in the area. “My family encouraged me to work hard for a successful career. I have always enjoyed drawing and the ICDL course has strengthened my focus to achieve my ambition. I really enjoyed the ICDL course and it offers something for everyone. My favourite subject was image editing whereby I had a chance to learn vital software for graphic design such as Photoshop. With the ICDL certification, I hope to build a graphic design portfolio that will help me when I begin my design career,” said the 21-year-old. Meanwhile, 21-year-old Joshua Raj said that the ICDL course was demanding but fun and it challenged him to be resilient and improve himself in the process. “The wonderful teaching faculty and facilities provided during the course have helped me enhance my computer skills as they enabled us to learn and conduct our assignments efficiently. The instructors made the learning process enjoyable and interactive, making it easier to understand the complex and difficult subjects. I am happy with my achievement and I plan to utilise the ICDL certificate to gain some work experience before furthering my studies,” said Joshua who graduated with a certification in Computer Maintenance. Michael Lee, Head of Programme at Montfort Boys Town expressed his gratitude to F&NHB for the Group’s continuous effort in helping the students at the home to learn and discover new skill sets that can give them the chance to realise their dreams. “Throughout the years, the F&N IT Corner programme has helped these youth gain access to exceptional digital literacy resources and also boost their self-confidence, which led them to believe that they too can achieve amazing things despite their underprivileged backgrounds. I would like to thank F&NHB for their contribution which will have a long-term impact on the students as they now have the right tools employers are looking for in today’s digital age,” Lee added. S.Arul, Deputy Director of Montfort Boys Town echoed Lee’s sentiment as he voiced his utmost appreciation to F&NHB for creating a conducive environment for the students to learn and gain specialised technical skills and knowledge that are highly sought after by today’s employers. “This year, Montfort Boys Town celebrates its 60th anniversary and the F&N IT Corner programme has significantly changed the students’ lives for the better. As the world is fast heading into digitisation and automation, most of the jobs out there require STEM (Science, Technology, Engineering and Mathematics) skills in order for companies to ride on the digital wave to progress. However, not everyone has access and the necessary funding for proper programmes to encourage computer education. “The F&N IT Corner programme has enabled us to bridge the digital divide and ensure that our students are not left behind in the IT revolution. For the past nine years, graduates of the ICDL course have gone on to become successful professionals in their respective fields, thanks to the F&N IT Corner initiative. As the pace of technological changes accelerates, we are committed to continue working closely together with F&NHB to prepare today’s youth for the future,” said Arul. Since 2010, F&NHB has invested RM100,000 in three F&N IT Corners at Montfort Boys Town in Shah Alam to equip the centres with the necessary computer equipment, printers, projectors, internet access as well as funding for the yearly ICDL course. 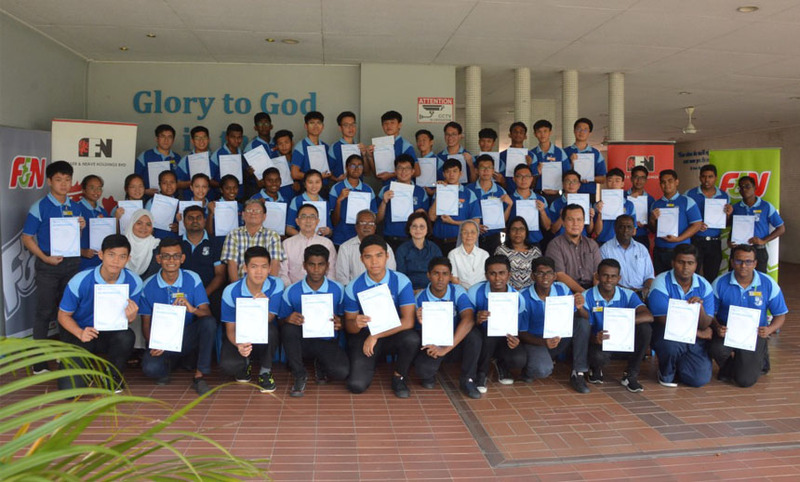 To date, 340 students from Montfort Boys Town have successfully graduated from the ICDL course and have found suitable placements in the working world. The ICDL programme is the world’s leading computer skills certification with more than 15 million people in over 150 countries participated in the course through 24,000 ICDL Accredited Test Centres (ATCs) worldwide.